What is the Childcare Hub? At Robert Wilkinson Pre-School we view children as strong, competent, capable and powerful with enormous potential for learning. The environment that we provide enables the children to foster and develop these skills and so our teaching and learning are mainly child led. This means that staff closely observe how the children are engaged in their chosen activities and come alongside them to then teach them and further their learning “in the moment”. This enables children to learn whilst they are doing what they are particularly interested in and are, therefore, more highly motivated and engaged and more likely to learn. Children have long periods of uninterrupted play in an indoor and outdoor environment that encourages them to be independent yet collaborative, to take risks and develop perseverance and resilience and to learn to problem solve and challenge themselves. 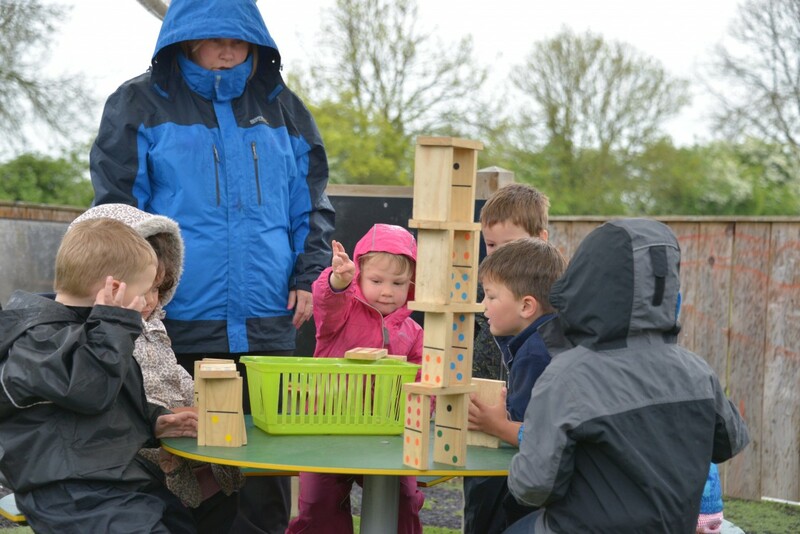 We place great emphasis on Outdoor Learning and enjoy using our Pre-School garden as well as the vast outdoor facilities and environment that our school is fortunate enough to have. Some activities are adult initiated and led. These activities tend to be to ensure the teaching of specific skills and an adult can model specific learning strategies to aid learning. We believe that creativity can be found in any activity and is strongly encouraged. 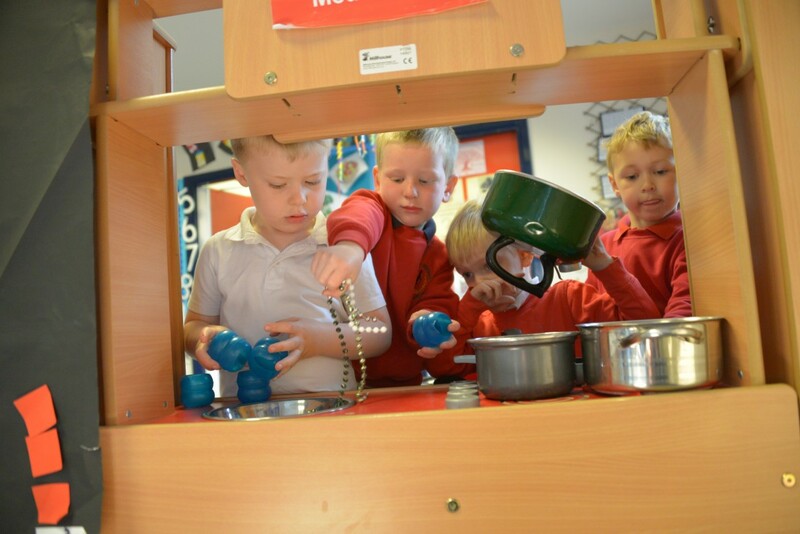 Pre-School staff observe and listen to the children as they play and learn and encourage them to be creative through effective, sensitive questioning and modelling alongside the children. Activities are documented on a whole class and individual basis through photographs and written observations and these are then collated into a class display with a written commentary and also celebrated through each child’s individual Learning Journey. This Learning Journey follows the child through from the beginning of their Pre-School time until they leave to move into the FS2 class. Reciprocal relationships between adults and children are essential and we respect and value the relationships we have with our children and their parents and carers. We welcome parents into Pre-School each day as well as for more set activities such as our regular half termly “Stay and Play” sessions, Christmas activities or Parents Evenings. We also hold Parent Information Workshops where parents can learn about the Early Years Foundation Stage curriculum, how their child learns at Pre-School and how they can help end encourage their child to learn at home. We value our relationships with the wider community too, with the rest of the school and with our partnership Pre-Schools in the village. We take part in wider whole school events and each Summer, as part of the Transition into School process, an Early Years Fund day is held where children who will be attending school the following year are invited from all the feeder Pre-Schools and Nurseries in our community. Before children are eligible for funding, sessions are paid for. Our hourly rate is £4, making our sessions £12 and a whole day £28. Once eligible for funding, this may be used to pay for up to 15 or 30 hours, depending on eligibility. Any sessions above this amount will need to be paid for. Parents may also pay for sessions suing Childcare Vouchers. Hot dinners are available to Pre-School children at a cost of £2.35 per day. These can be ordered and paid for in advance on our online ParentPay system. Alternatively, children may bring their own packed lunch. The Pre-School children eat their lunches in the Brown Hall situated in the main school building. They mix with their FS2 friends and it helps enormously with the transition to FS2. We take children from the beginning of the term before they are 3 for afternoon sessions. Afternoon sessions are held from 12.15-3.15pm each afternoon. The term after a child turns 3, they are entitled to a Universal 15 hours Government funding. Once they are eligible for this funding, they are able to attend mornings only, mornings plus lunches or full days. Pre-School children wear a red sweatshirt to show that we are part of the wider school community and this is required for all children. Some children wear the full school uniform – we are very flexible, but do ask that all children wear a red sweatshirt. We are fully inclusive of children with Special Educational Needs and DIsabilities (SEND) and children who have other additional needs. All staff work alongside these children and their parents, as well as the SEND Team within school to employ various supportive strategies so that the children make progress and enjoy successful outcomes and access the curriculum alongside their peers. The UK's biggest food bank charity handed out 1.6 million food packages last year.